Who will do what in a lawsuit? It is not always easy to determine the roles of people involved in process activities. Often, when designing a process, we get lost in some detail and end up not clearly defining responsibilities. To facilitate this process of defining roles and responsibilities in an organization or in processes, we have the RACI model. It is a responsibility matrix, called the RACI matrix, which creates a map of responsibilities for process activities. In this post you are going to find out what a RACI matrix is, its meaning, how to make a responsibility matrix, plus some accountability matrix examples, to inspire you. What is the RACI matrix, anyway? The RACI matrix or the RACI table is an easy-to-use visual tool that clearly defines the attributes, roles, and responsibilities of each employee in the activities of a process or a project. Is it clear to you what is the responsibility matrix? Great! So, now check out the meaning of RACI. To understand what the RACI matrix is you need to see the meaning of the acronym. Is the meaning of RACI now more clear to you? All right, let’s explain it in more detail! Each of these words refers to the duties and responsibilities that an employee has in the tasks of a process. Responsible: is the person in charge of performing this task in the process. This collaborator is the one doing the work, so it is this person who is delivering to the next stage. Accountable: Can the process task be started? Was it done properly? Are you within the standards desired by the company? The person who is accountable monitors the completion of the process, gives permission for it to be initiated (in some cases) or approves the result and delivery. Usually the owner of the process, a supervisor or manager fulfills this role. Consulted: This is a person who can contribute to the process. This individual can be in or out of the organization and consulted so that the process is carried out in the best way. They support the process with experience and knowledge. Informed: As the process is in progress, some people need to be informed of the performance and deliveries. Whenever any activity has important consequences for any of the people involved, it should be included in the list of the informed. Also read: Understanding Office Automation. Now that you know the meaning of the RACI matrix letters, it’s time to learn how to put together a matrix of responsibilities. To do this, just follow a few steps, check it out! Similarly, there must always be at least one accountable person for each task. On the other hand, there can be no more than one accountable person for the same process activity. The person responsible for an activity may also be accountable. Ideally you should have only one person responsible for each activity. This avoids parallel processes or duplicity. But if it is really necessary to define more than one responsible person, the division of tasks for each one must be clear and very well defined. Is the way in which the RACI accountability matrix is setup now clearer to you? Do you think you could create one for your business? How about checking out an example of an accountability matrix to make sure you’ve truly mastered this process? Or better yet, how about seeing 4 examples? We have selected 4 RACI accountability matrix examples for you to see, in practice, how they work. This is a very simple example of a RACI accountability matrix. Note that it lists only the names of those responsible in the first line, without indicating positions or functions. In a sense, the ideal way is to indicate positions and functions, because the processes are performed by people who are capable of performing each task. Thus, if one of these employees is disabled, or even leaves the company, the RACI table would have to be redone. Which is not ideal. Therefore, it is recommended not to use the names of people, but the roles or positions they occupy in the company. In the case of someone involved outside of the company, one must act in the same way. This second responsibility matrix model adopts the positions of those responsible in the first line. It is a RACI matrix for a system development process. Note that the person responsible for a task (marked with R), can be the one consulted (C) or informed by the other (I). They can even be the accountable (A) person of another task or activity. This happens in the Analyst column, for example. In addition, note in the manager’s column that this employee of the company is both responsible (R) and accountable (A) for the activity “Monitor development”. This is indicated as follows, in the corresponding cell: R / A. Finally, it is worth mentioning that one of the members on the RACI table may not be responsible (R) for any activity, accountable (A) nor consulted (C). This is the case with the assistant (last column) that is only informed (I) of all activities that occur during the process. In this example RACI matrix, besides those involved being indicated by well defined positions, there is a special particularity. A new type of responsibility was created, the tester, indicated by the letter (T). This is because it is a software development process. In processes with this, where certain vital responsibility is quite specific and differentiated, this may be necessary. In this case, testing the software is an important step that could not be represented by the conventional letters of the RACI matrix, nor by the additional ones. Therefore, when it comes to a process with these characteristics, one can create a new category of responsibility, define a letter for it and indicate it in the table. Note that this is what happens in all of the columns in the last row of the RACI matrix example. Also see: Business Process Management Suite: A combo of BPM tools. On HEFLO BPM responsibilities are presented on the portal and allow the user to quickly identify their responsibilities. After everything we’ve seen so far, you may be wondering: why use the RACI methodology? What are the benefits of this? Help other process members know who to report to, ask for help, or charge a delivery. It prevents a process from stopping because someone has failed to fulfill a responsibility assigned to them. Easy to use and create, visual and intuitive tool. A practice that allows you to be consulted quickly. It stimulates communication between team members, collaboration and teamwork. Clear and objective division of tasks between the working group members. Greater sense of responsibility. The jobs and results of others depend on the performance of each ones work. Allocate resources in the right measure for each employee. Prevents the duplicity of tasks. If a team member leaves, the backup knows exactly what to do. Do you use the RACI matrix in your company? 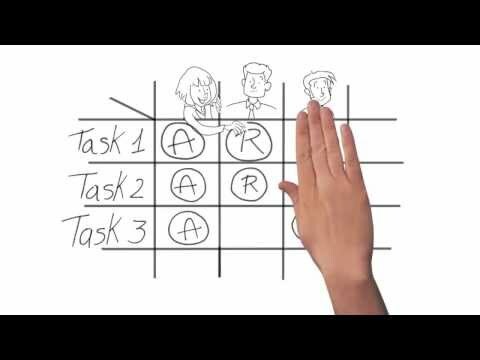 Did you already know about the RACI matrix? What did you think of it? Do you want to use it in your business? – Tell us about your experience with this tool in the comments.